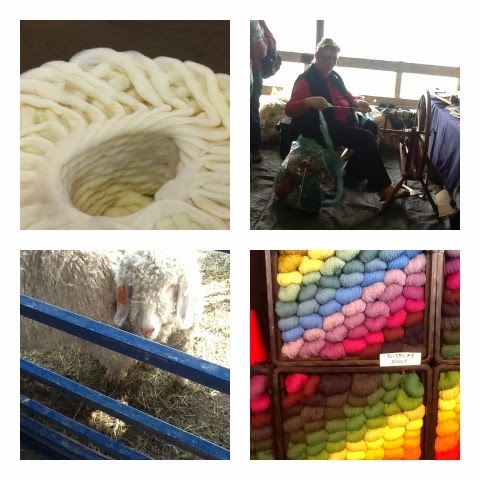 As we reflect on another year at Lady Dye Yarns, we would like to share with all of you an amazing adventure we went on this past October where we able to make it to Rhinebeck, NY for the Duchess County Sheep and Wool Festival. This has become an annual event for us and what a way to close out 2013 than to share with everyone our favorite road trip event of 2013. Though we are seasoned veterans of the event, it was a good time, as always. There were so many adorable sheep (not to mention a few llamas and angora bunnies in the mix!) Most of them were being given haircuts, although there was one sweet sheep rocking some pretty funky dreads. The vendor situation at Rhinebeck can be a bit overwhelming, there’s so much to see! One standout was Hope Spinnery, a really cool wind-powered fiber arts studio. Based in Maine, they have really beautiful, naturally dyed yarns as well as patterns and custom knitwear.A few vendors had some pretty interesting displays- both good and not so good. We were really into one in particular that had their yarn meticulously arranged by color into a pretty rainbow pattern-so awesome. As for swag, we were pretty selective this year, but we did manage to score a size-able bag of merino roving for a good price. Lots of dyeing to be done!